Visitors to Todmorden Town Hall will be able to celebrate its 144th birthday and discover its fascinating history at the next tour of the iconic building. On Sunday 7 April from 2pm, volunteers will run a free guided ‘taster’ tour of the Town Hall, telling stories of its past to mark its anniversary. The Town Hall turns 144 on Wednesday 3 April. The building was commissioned by the Fielden family of Todmorden and designed by esteemed architect John Gibson. The family also commissioned Gibson to design a number of other buildings in the town including Dobroyd Castle and the Unitarian Church. When the Town Hall opened in 1875, the Yorkshire and Lancashire border ran down Walsden Water, so for 13 years the Town Hall sat half in Yorkshire and half in Lancashire. In 1891 the Fielden family handed the building to the people of Todmorden and the Local Board thanked the Fieldens for a ‘most honourable and noble gift’. To this day it belongs to the people and is the People’s Palace. “The free Town Hall taster tours are a great way to find out more about this magnificent building and see its impressive interior. All ‘taster’ tours run on the first Sunday of the month and start at 2pm on the bridge opposite the pediment at the top of Halifax Road. If you’d like to find out more, or if you’re interested in becoming a Town Hall volunteer, please contact Todmorden Information Centre at info@visittodmorden.co.uk or telephone 01706 818181. Todmorden Town Hall is also available to hire. 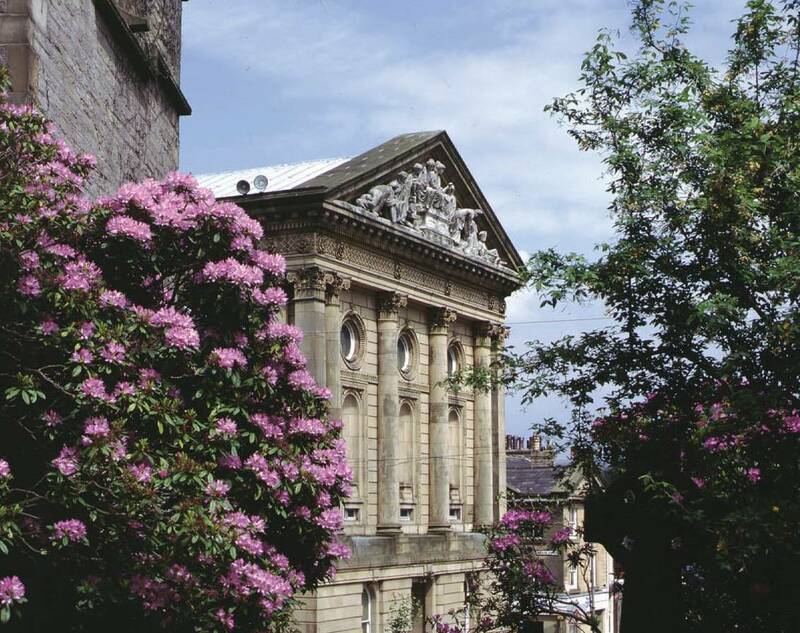 To find out more about hiring the venue, visit www.calderdale.gov.uk and search for ‘Todmorden Town Hall’. You can also contact halls@calderdale.gov.uk, for more information or to discuss requirements. This entry was posted in Arts and culture, Distinctiveness, Heritage. Bookmark the permalink.